Margaret “Peggy” Anne Thomas, of Willow Valley, loving wife of Dr. Stephen Charles Thomas, passed away on September 29, 2018 at the age of 82 after a long illness. Peggy was born on August 15, 1936 in Philadelphia, Pennsylvania to the late Albert and Louise Elizabeth (Page) Schroeder. She was a 1957 graduate of the Presbyterian School of Nursing in Philadelphia, and worked as a Registered Nurse in Philadelphia and Maine before moving to York in 1961. Peggy spent many years in York working as receptionist and bookkeeper at her husband’s dental office. She loved getting to know the patients and learning about their families and lives. Peggy was an active member of St. Edwards church where she served on Altar Guild and enjoyed participating in the Knit Wits group. 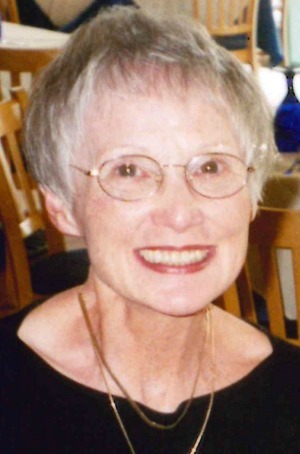 In addition to her husband of 58 years, Peggy is survived by her son Stephen (Lisa) Thomas of Woodstock, Georgia, and daughter Gweyn Thomas (William Morse) of Brentwood, Tennessee; grandchildren Stephen Thomas, Paige Colaberdino and Thomas Colaberdino. Her sister Louise (John) Tumolo of Elizabethtown, twin sister Mary Stauffer of Landisville, and many nieces and nephews, also survive her. Relatives and friends are respectfully invited to attend a Memorial Service at St. Edwards Episcopal Church, 2453 Harrisburg Pike Lancaster, PA 17601 on Sunday, October 14, at 2:30pm with Reverend Stephen C. Casey officiating. Friends may greet the family from 1:30pm until the time of service. Interment will be in the St. Edwards Memorial Garden. In lieu of flowers, contributions may be made in memory of Peggy to St. Edwards Episcopal Church. Peggy’s family would like to express their deepest appreciation to the caregivers who were so loving, compassionate and kind to her during her illness: Linda of Connections at Home; Ariel, Heather and the staff at The Glen at Willow Valley; and Nancy and Keily of Caring Hospice. Jay and I are very sorry to learn of Peggy’s passing. When we needed to visit Dr, Thomas we were always welcomed by her smiling face. She was always interested in hearing what we’ve been up to and catching up on the kids lives. I really missed her when she was no longer at the office. Our sympathies to Dr. Thomas and their family. So sorry to hear about the passing of such a lovely lady. She and Dr. Thomas always greeted us like family when we showed up at the office.. My heartfelt condolences. For Charlie and family: Lee and Amy Dmitzak, StoneGate, here. Please accept our deepest sympathies at Peggy’s passing. Amy first saw the obituary in Sunday’s LNP, and we stopped for some time to talk about Peggy. How she always had a smile on her face, and always had something nice to say about people, places, and things. Our favorite note in the message about her was her participation in the Knit Wits at St. Edward’s. That’s so much like her. Joining a group with a pun name. Charlie, we wish you all the best, and miss catching you on your strolls up and down Huntington place. So sorry to hear of Peggy’s passing. She always made a visit to Dr. Thomas’ a little more pleasant. She always had a smile on her face and loved when the children came in the office. Our prayers are with Dr. Thomas and family. So sorry to learn of Peggy’s passing. A visit to you Charlie, was always pleasant with a visit with Peggy. I’ll share words that were meaningful to me after Bob died. Grief never ends…but changes.It’s a passage, not a place to stay. Grief is not a sign of weakness nor a lack of faith.It is the price of love. I had the privilege of meeting Peggy when she moved to Stonegate. She is truly one of the sweetest, kindest ladies I have ever met! I will miss her sweet smile and personality! Our sincerest sympathies to Steve, Stevie, and family. Our thoughts and prayers are with you. Dr. Thomas, I am so sorry to hear about Peggy. My thoughts are with you and your family. It was truly a pleasure working with you both, and Peggy will never be forgotten. Please accept our deepest condolences . Thinking of you and wishing moments of comfort, peace and healing prayers.